Pressure washers can be powered by gas (gasoline) or electric motors. The former type of washer generally features engines, and most engines are powered by brand-leader Honda. Electric-powered units, on the other hand, are powered by AC power. Though you can get a more powerful machine by opting for gas over electric, for example, you’ll have to know what you’re looking for to get value for your money. Below, we’ve chosen 5 of the best gas-powered pressure washers that you can buy right now. This pressure washer would suit anybody looking for a machine that can perform commercial functions, though it could also be used for non-commercial purposes. It outputs one of the highest CU ratings we’ve looked at, whilst also being relatively inexpensive for a premium range model. As is the case with most gasoline or gas-powered washers, this model is powered by a Honda engine putting out 13-Horsepower. A CARB-compliance certification means that the engine isn’t bad for your carbon footprint, whilst a built-in thermo-sensor gives you peace of mind that the machine won’t easily overheat. This is all supplemented by a range of nozzle attachments that are simple to connect. Not only is the Honda engine built to last, but it runs extremely quietly, too, whilst putting out a level of cleaning efficiency rarely seen in a washer of this size. ​You get 50 feet of hosing that allows easy reach around large vehicles or to the upper floors of properties, and what’s more, the hosing is steel-reinforced to give greater durability. Though this pressure washer is very lightweight and therefore easy to maneuver, it’s hindered slightly by a lack of wheels, having just 2 rather than the usual 4 seen on washers of this size. This makes it more difficult for the bearer to carry. This design choice is supplemented by a frame that doesn’t quite protect the internal components to the same degree as competing units, given the minimalistic chassis. The SIMPSON Cleaning ALH4240 Pressure Washer is driven by a powerful gasoline-fueled engine. Though the manufacturer doesn’t specify the exact power of the Honda engine, it’s sufficient to output one of the highest CU ratings we’ve reviewed, which is why it makes our list. The aluminum used in this design is aircraft-grade, so you can be sure of the machine's quality. An oil alert system protects the engine from low-oil damage, whilst an adjustable wand allows you to change PSI on the go. On-board storage provides space for all your accessories, and a detergent injection system helps fight those tougher stains. This product is such excellent value for money, that this isn’t even an exhaustive list. Quick-connect fittings on the end of the hose not only allow you to extend the hose, but also make accessories quick and easy to attach. Additionally, a heavy-duty steel-braided hose prevents tangling and abrasions. The quick-connect fittings for nozzles and additional hose extensions are a strong addition to this model – when they work. Unfortunately, the ball bearing connectors don’t always depress easily, which can make these fittings fiddly at times. That said, there isn’t much else negative to say about this model, other than the fact the frame is extremely minimalistic, to the point where there’s not much support around the delicate engine. 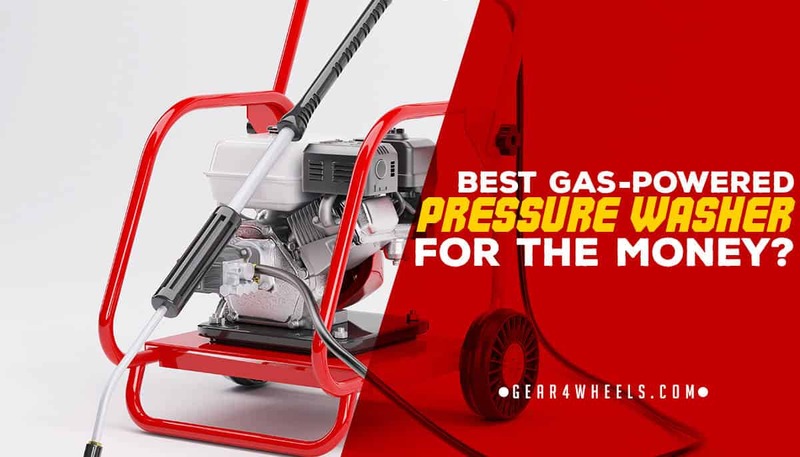 Of the pressure washers that we’ve reviewed, the Generac 6565 4,200 PSI model has the highest CU rating, meaning that it’s the fastest of the bunch. It has few drawbacks and plenty of positive feedback within the cleaning industry, meaning it’s an obvious choice for our list. Amongst the most notable features of this pressure washer are a low-oil sensor, which triggers a shutdown when oil levels reach damagingly low levels, as well as giant pneumatic wheels that help the machine to withstand rough environments common in commercial cleaning environments. The real selling point of this machine must be the high CU rating, afforded by equally high GPM and PSI figures. It’s one of the most efficient models we’ve found, and what’s more, it can run for up to 2 hours with a full tank. It can also pump out heated water thanks to the gas-fueled water heater built in, which increases the cleaning capability of this machine further. As might be expected from a machine with such powerful cleaning efficiency, this model suffers in areas such as loudness and vibration. It is advisable to wear earmuffs when operating the Generac 6565 washer, whilst handling the unit can also be tricky owing to the amount of recoil that the hose and gun give off whilst in use. These points aside, it can also be tricky to power up this machine, as the pull cord must be operated in conjunction with another handle, simultaneously. We’ve chosen this model as a cheaper alternative to the similar Generac 6565, as it offers a great deal of power, but at a reduced price tag. A durable, professional-grade triplex pump offers a lifespan typically 4 times longer than axial cam pumps, whilst the 302-cc engine drives a powerful clean for this price tag. This model also features a low-oil shutdown and a range of varying angle nozzles. Though this machine has the power to rival some of the better models on this list, it is around half the price. The 302-cc engine sits within a well-built frame that offers a lot of protection and sturdiness, and is supported by oversized tires that are resistant to punctures and general wear. This machine tends to be quite loud when operating; that isn’t to say that the engine itself is overly-loud, but the components do rattle excessively. What’s more, some of the space within the large frame feels wasted in that it could easily support a larger fuel tank than it has. Simpson’s MSH3125-S Pressure Washer is deceptively lightweight for its appearance, but still puts out a reasonable amount of power owing to its Honda engine. However, at 7,750 CU, this is a washer that is more suited to smaller home-based tasks as opposed to commercial functions. For a smaller, mid-range pressure washer, this unit brings a few bonus features that aren’t always a mainstay of non-commercial machines. A safety lockout function stops water from being ejected automatically when not in use, and a range of varied nozzles provide different angles and spread of water. What’s more, one of the most key features of a smaller washer is the ability to move it easily around, and this isn’t a problem with such a lightweight design. As mentioned, this is a lightweight model that is easy to maneuver, making it perfect for lifting and shifting when washing cars or complex objects with a large surface area. This is in part possible due to the products’ weight, which is just 70 pounds. Despite this small stature, the machine still manages to pack in a gas-powered Honda engine that’s extremely easy to power up and operate. It’s clear from historic feedback on the product that there was a production issue with the nozzle attachment holder, but this appears to have been rectified by the manufacturer. Moving on, we don’t love the design of the hose, which has less flexibility than other models, meaning it’s harder to coil. The oil filter is also temperamental, becoming easily clogged by oil, which can halt your cleaning in its track until cleared. Engine is straightforward to start up and even easier to maintain. Oil filter can easily become clogged and will not start up if this happens. After carefully choosing the top 5 gas-powered pressure washers available, we’ve settled on the Pressure Pro E4040HC as the pick of the bunch. Apart from being heavy and having a limited warranty on most parts, there’s not much else negative to say. It’s got a powerful CU rating, plenty of hosing to support larger cleaning tasks, and is built to last from durable components.